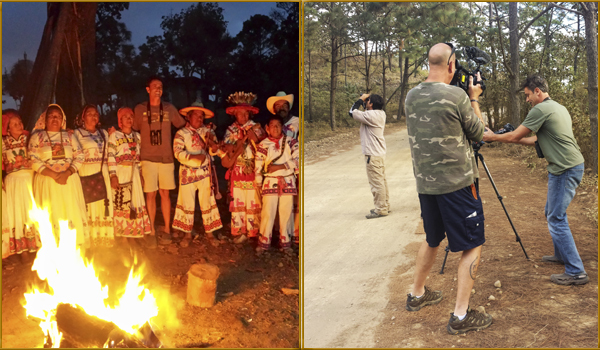 Riviera Nayarit Mexico Blog: The Riviera Nayarit Is Back On The Discovery Channel! The Riviera Nayarit Is Back On The Discovery Channel! The “Tufted Jay” and “Orange-breasted Buntings” episodes were produced in the Destination and transmitted twice each on the Discovery Channel, which reaches 65 million homes around the world per broadcast. Once again the Riviera Nayarit reached all the countries accessed by the Discovery Channel’s Destination America. James Currie, host of Nikon Birding Adventures TV, the only and most important birding show in the United States, has done it again. “The Riviera Nayarit is not only one of the top destinations in North America for birding, it’s also a Mecca for sport fishing, surfing and whale watching, not to mention culture, cuisine and adventure,” he says at the start of one of his episodes, where he also mentions San Blas as the birding capital of the region. These productions are a direct result of the work done by the Public Relations department of the Riviera Nayarit Convention and Visitors Bureau (CVB), which continuously strives to elevate the positioning of the Destination through its unique natural and cultural offerings. The programs, lasting a little more than 20 minutes each, were centered on the search for bird species endemic to western Mexico. The episodes were named after the birds themselves: “Tufted Jay” (Cyanocorax dickeyi) and “Orange-breasted Buntings” (Passerina leclancherii). The two videos also showcase the Sierra Madre and its population of ethnic Wixarika, or Huichol, people; the lagoons at Santa María del Oro and Tepeltitic; the Islas Marietas; Punta de Mita; Lo de Marcos; San Pancho; Sayulita and San Blas. Each program was transmitted twice on the Discovery Channel, which has a reach of 65 million homes around the world per broadcast. Click below to enjoy these special episodes in their entirety on the Riviera Nayarit’s YouTube channel!